Our research shows that absence costs a staggering amount for UK business – with CEO Today quoting £100 per employee per day. And if an employee is taking 7 or more sick days a year, which our research also suggests, then for a business employing 1,000 people that’s a lot of money. 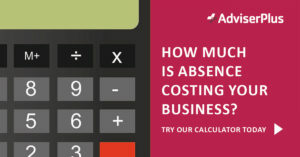 We’ve developed an online absence calculator to show you how much absence is costing your business, resulting from lost productivity and sick pay.